Europeans are feeling less positive about the EU. And, at the same time, political instability within European countries appears to be on the rise. In a recent report to clients, Goldman Sachs shared two interesting charts on the bubbling situation in Europe. The first chart, on the left, shows that the percentage of respondents in various European countries who have a very favourable or somewhat favourable view of the EU has fallen over the last decade. Notably, the growing political instability and dissatisfaction with the EU seem to be at least partially correlated with globalization and economic stresses. Relatedly, The Economist recently shared a chart comparing the percentage of native- and foreign-born people 15 or older with tertiary, or college-level, education in various OECD countries. The data are from 2011, but it’s notable that members of Britain’s foreign-born population were more likely to have a tertiary education, which – excluding any prejudices employers might have toward migrants – suggests that less-educated native-born Brits might get bumped out of better jobs. Plus, although it’s certainly not a perfect comparison, we’re seeing something similar in the US as American workers who have been economically burned by globalization have increasingly supported protectionism and populist candidates such as Donald Trump and Bernie Sanders. Christopher Furlong/GettyVote Leave supporters wait for London Mayor Boris Johnson to address campaigners during a rally for the ‘Vote Leave’ campaign on April 15, 2016 in Manchester, England. Boris Johnson is taking part in a 48 hour ‘Brexit Blitz’ of campaigning in Northern England. 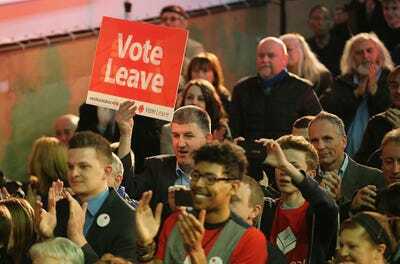 Britain will vote either to leave or remain in the EU in a referendum on June 23. As for what this means in the long-run, analysts have been arguing that we could be looking at continued political uncertainty and limited coordination in Europe in the longer run.